Axego is the rare restaurant that we will go to TWICE in one trip. Though we rarely visit the same place, we loved Axego’s setting, the food and the warm service so much we decided to make it our last moqueca in Salvador. We also could not believe the extremly reasonable price. The menu at Axego is pretty varied and has all the typical Bahian dishes you may expect. However we were there for one thing alone – Moqueca. On our first visit we decided to branch out into a type of moqueca we had never tried before: Aratu Red Crab (R$48). This rounds out to about $25 US or less than $13 a person – good deal! Now we absolutely love moquecas, and over the past year or so have sampled enough so that we know exactly what we are looking for. First – it has to come to the table piping hot, preferably in or on a stone bowl. In terms of the moqueca itself: it has to have not too runny of a sauce , high quality protein, good dende flavor and a nice and varied amount of sides in non-stingy portions. M would also add that there has to be a spicy pepper sauce to spice things up. Never have all of these elements come together so well than as at Axego. The moqueca itself came our absolutely filled to the brim with Aratu, a strongly-flavored and tasty crab dish. No filler or watery sauce here! On our second trip we went with our old standby – moqueca de camarao. Both were equally delicious, though the uniqueness of the Aratu gets our vote. We can get shrimp just as well in the US. Moqeuca de Aratu (red crab) – a rare treat even in Bahia. On the last visit we made to Axego we were even lucky enough to hear a live Olodum concert while we were eating – not IN Axego, mind you, but rather in a largo right behind the restaurant. Dinner and a show all for the price of a few mediocre sandwiches back in the US. The space of the restaurant itself is very nice, in a restored colonial rowhouse. The inside is mostly wood, and an entire wall is dedicated to a a creatively-displayed selection of Bahian artifacts and art works. Music provided by Samba Chula de Sao Braz and Raimundo Sodre at Sankofa African Bar. 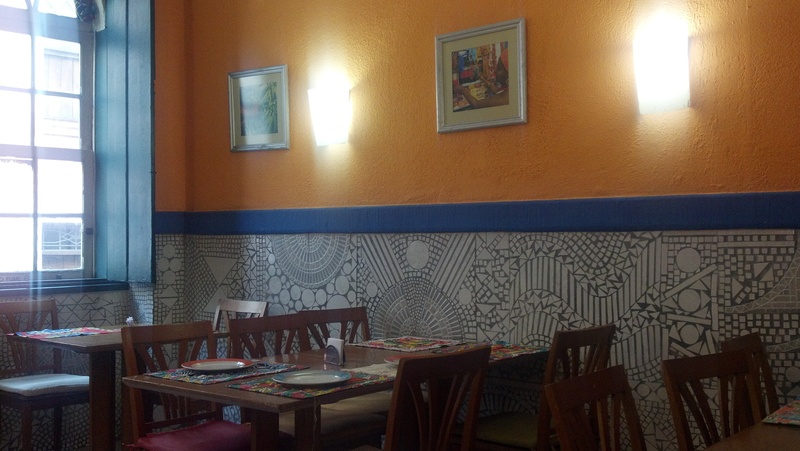 We highly enjoyed our moqueca at Axego, and we hope we are able to go back soon. Along with tasty food, Axego has all of the intangibles that we love in a restaurant, welcoming service, pleasant atmosphere and a good vibe. If you are going to get one moqueca in Salvador, make it Axego! 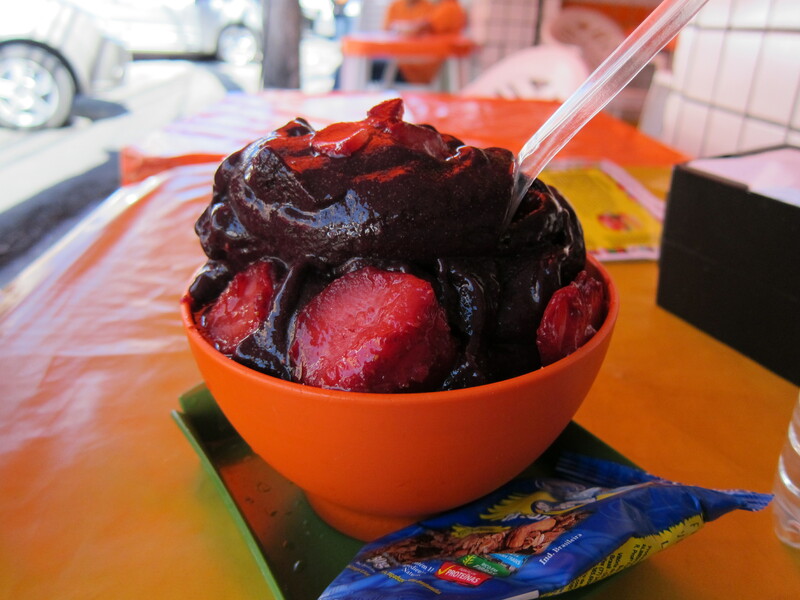 In our travels we met perhaps the most amazing food cart purveyor in all of Brazil, nay, Latin America! His name is Picoleishion, and he is a one-man show based in the town of Itaparica, on the northern tip of the island of the same name. He sells picole, which is simply Portuguese for “popsicle” but he isn’t a normal popsicle seller. Picoleishion is readily identified by his gigantic sombrero, frenetic dance moves and the fact that his popsicle cart is actually a giant boombox blaring Axé hits like “Billie Jean” by Magary Lord. Check him out in action (and again). The Praia do Forte in Itaparica is idyllic and quiet, and Picoleishion is hard to ignore as he rolls across the beach blaring his tunes. Over the course of one beach day we sampled 4 picoles – Mangabation (Mango), Limation (Lime), Chocolation (Chocolate), and Amendoimshion (“Peanut” was basically a peanut butter popsicle –cool! que legal!). Picoleishion is definitely a charismatic guy – and had beachgoers dancing and posing for pictures, so it is no surprise to us that he is a minor celebrity and has made an appearance on the Jô Soares show, a Letterman-type talk show in Brazil (at the start of the clip below). We love you Picoleishion! Adorei Picoleishon! We had some good kibbe (fried Middle-Eastern bulgar-and-meat meatballs) in Rio. But this tiny little counter in Salvador blew them away. You can’t miss Kiberia’s signature neon orange building, tiny as the restaurant itself may be. There are maybe only four seats in counter space in Kiberia, and the take-out trade is brisk. With three people in there it was a full house! The menu truly is limited, and all you can order are several permutations of kibbe and bottled or canned drinks. The cost for a kibbe (500 grams) is a surprisingly reasonable R$ 6. Another option is to get 6 mini-kibbe for R$ 12. In the larger size, you can get a plain meat kibbe or one with cheese added (paradoxically this one is slightly cheaper and smaller). As kibbe purists, we went for just plain meat. The kibbe were fried up to order, and came to us piping hot, even garnished with a wedge of lime. The shape of the kibbe was not too overly-footballish, as we were accustomed to seeing in Rio. The outside was perfectly crisp and crunchy, and the bulgar and meat inside was tender and moist. We also appreciated the wide range of dressings set up on Kiberia’s counter: tahini, sriracha, malagueta pepper, tabasco, Molho Arabe and garlic sauce, among others. We ate our kibbe so quickly, we were not able to get any pictures. Even after devouring our kibbe, we decided to go for a dessert. The only choice was a Belewa (spelled elsewhere as Beleua), for R$ 3. Beleua is a riff on baklava, but definitely not as sweet, and is composed of a spiced nut paste in layered puff pastry sheets. Like our kibbe, the beleua was delicious. We went into Kiberia expecting only a fast food fix, but we heartily recommend them for some great kibbe in Salvador. 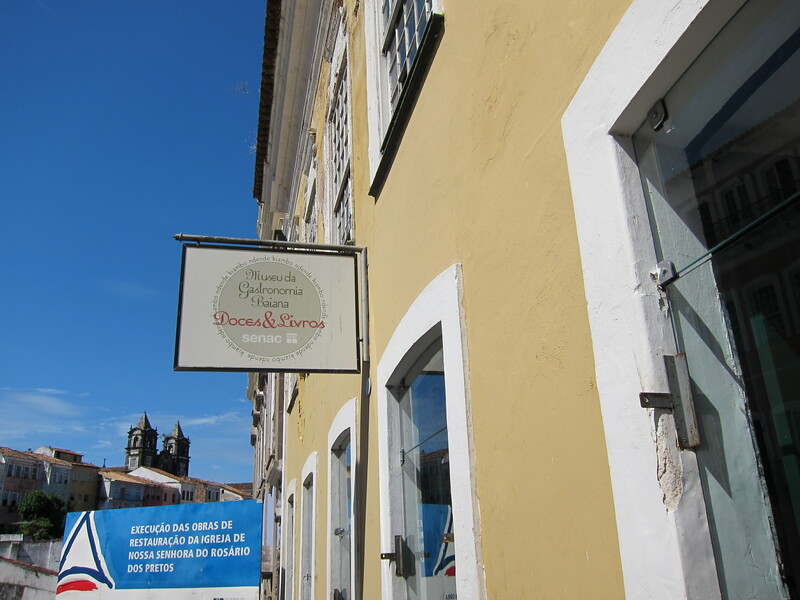 A Place for Macarons… in Salvador! We recently wrote about the boom of Macarons in São Paulo. However, the trend has even trickled down to Salvador, the 3rd largest city in Brazil. In Shopping Barra, there is a relatively new store, called Avignon, which specializes in chocolates and macarons. The macarons are R$ 4.50 apiece in come in a variety of Brazilian and classic French flavors. 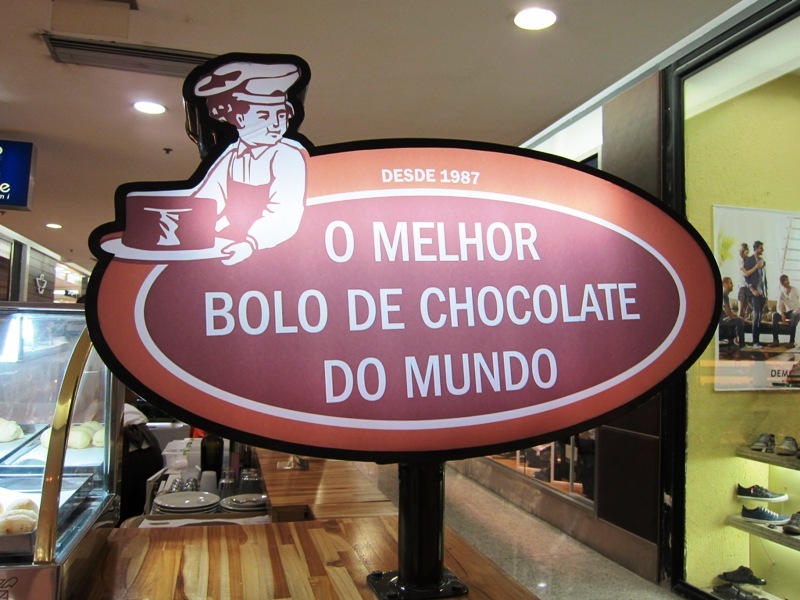 When we visited there were: Doce de Leite, Chocolate, Almond, Passion Fruit and Strawberry varieties. While good, the macarons were a little soggy, not surprising given the humidity in Salvador, I guess. However it was great to sample a macaron after a 6-month drought! Other treats available at Avignon included financiers, croissants and a selection of chocolates. There is also a small menu of drinks including espresso and hot chocolate. Definitely a taste of France in Bahia! On Saturday, we had the honor of being invited to the to the Ilê Axé Ijino Ilu Orossi, a temple (ilê axé) of candomblé nagô, an Afro-Brazilian religion closely related to the religious practices of the Yorùbá people of southwest Nigeria and Benin. The Saturday before Easter is one of the most important dates in the candomblé calendar: this day celebrates the new year with the Festa de Exu, a day-long celebration for Exu, the orixá (deity) of choices, pathways, and beginnings. At Orossi, the Festa de Exu is a lavish affair: a packed house, dressed all in white, dances and sings for six hours while navigating their way around spectacular offering altars and assemblages. Food and eating are important parts of the ceremony, and we were happy to take part! Two female initiates (ekedi) standing in front of offerings for Exu, including mini acarajé. In a candomblé ceremony, it is just as important to feed your guests, and all attendees, as it is to feed the orixás. While Exu was very hungry on this day – he received extensive offerings of alcohol and meat – guests all received food as well, and enough to last us all day. Shortly after the first round of offerings to Exu, all guests seated in the audience section were invited to the main floor of the axé to receive a portion of abará, a dish resembling a tamale. 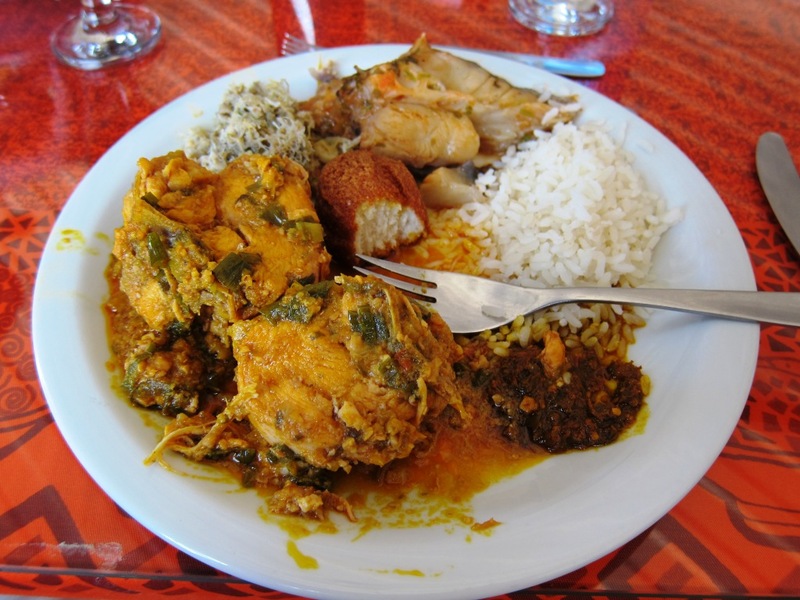 Abará is a classic Afro-Brazilian dish and frequently used in candomblé ceremonies as a food sacred to the orixás. It consists of bean curd mixed with dendê oil, wrapped in a banana leaf, and steamed (the same base as acarajé, the other classic Afro-Brazilian dish, but acarajé is fried instead of steamed). Abará, like acarajé, is very filling, and we had to force ourselves to finish just one by the time attendees came around to collect our used banana leaves. After everyone had eaten their abará, the ceremony entered its most exciting part. We once had a friend describe a candomblé ceremony as a party for all the gods where all the gods actually show up, and it’s true. On this day, three orixás arrived to interact with attendees and dance with initiates: Pomba Gira, a female version of Exu who loves to smoke and drink; Iemanjá, the orixá of the deep sea and motherhood; and Ogum, orixá of iron and war. After the orixás had come and gone, and while we were still full from our abará, two men brought out a huge metal pot of feijoada – more than enough to serve the fifty people in attendance with a bunch left over. As always, guests were invited up first: we were given a decorated ceramic bowl, and then guided up to the ekedi who served us a heaping bowl of feijoada. That’s not all: out of nowhere appeared a buffet of accompaniments: rice, tomatoes, lettuce, green peppers, and pimenta malagueta: a sauce of flavored spices and famously hot malagueta peppers that is the classic accompaniment to any Bahian dish, but definitely not for the faint of heart. While we are not usually big fans of feijoada, this was excellent: beans, pork, and chicken cooked to perfection in a flavorful sauce, and the fresh veggie accompaniments and pimenta made for a very satisfying and filling meal. After six hours of exhausting singing and dancing, finishing off the feijoada put everyone into a food coma, and all the initiates in the house concluded the day by sleeping on the temple floor. A great end to a beautiful day of food and celebration for the orixás! M’s feijoada, complete with three spoonfuls of pimenta – apparently a record! After eleven weeks in Rio, we are heading back to Salvador da Bahia for two months! 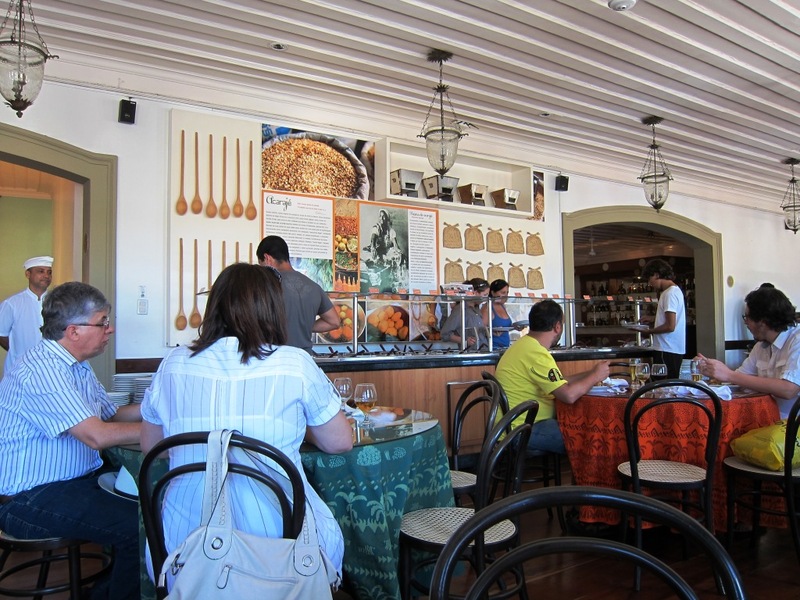 We spent a good chunk of early 2012 in Salvador, where we sampled all the local specialties from acarajé to moquecas, and we are ready for more. Stay tuned! In general, it seems that Bahians do not like to eat at restaurants. Street food, little hole-in-the-wall places, vendors on the beach, these things Salvador does and does well; but the idea of dressing up and heading to an expensive restaurant for a long meal does not seem to be in the wheelhouse of most soterpolitanos. Which is why, as Chicagoans, we had to give Salvador’s most acclaimed restaurant a try. When we read Veja Salvador’s annual food issue and their glowing reviews of Paraiso Tropical (Best Moqueca in the City! Best Chef in the City! ), we knew we had to go. That would be the difficult part: tucked away in the central Cabula neighborhood, the restaurant is almost impossible to get to from Barra. We had to take a bus to a large shopping mall and from there a cab – gasp! – through the only road leading to the isolated bairro. A confused cab driver to boot, and a trip of nearly two hours and R$40 (about US$25) and we were finally there. But no one else was. We were so sure to make a reservation, we had to laugh when we arrived at 5:30pm on a Wednesday – about four hours before Bahians usually eat – to a huge, and largely empty restaurant. Inside, though, it was something of a paradise. The dress code seemed typically Bahian, with the only other couple donning jeans and tennis shoes. Simple wooden tables surrounded a central area of greenery. Our second floor table looked over the restaurant interior, while a large jabitiquaba tree’s branches nearly touched our plates – and oh how we wanted to grab some of the fruits! The menu was extensive, with many moqueca offerings. Beto Pimentel, the Chef, has done a masterful job putting inventive and welcome touches on Bahia’s most famous dish. His offerings were divided into traditional and special moqeucas, and we opted for one of the special shrimp moquecas, to split. To this day, we are not quite sure of all that was in it. Fibrous nuts, tomatoes, peppers, any number of small sea creatures, long noodles of gelatinous consistency, and much more dendê oil than we were accustomed too (and we believe less coconut milk). Accompaniments were shockingly good farofa, with an orange peel added to absorb a little moisture and add flavor; spicy sauce made of malagueta peppers (good for M and his spice addiction), dried yucca; and rice. All of which was fantastic. The combinations of flavors of the moqueca felt more like intriguing contradictions we were pleased to be eating. The many different textures and shades of foods all cooked together was a seeming metaphor for all Bahian cuisine in one dish. Unwaveringly complex and yet consistently delicious, we know this would easily be the best moqueca we would have in Bahia, or at bare minimum, the most inventive. We were sure to eat slowly, savoring this dish, as we knew we would not be back anytime soon. But, of course, there was dessert! 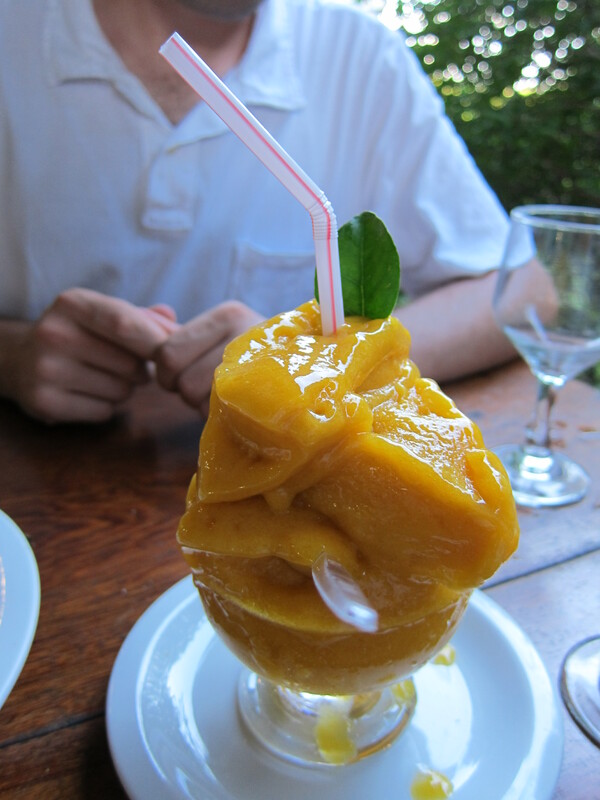 Paraiso Tropical, in addition to moquecas, is famous for its roscas: think of these as fresh fruit juice, frozen, and then very lightly thawed to a smooth but icy consistency, then piled high on a dish. We opted for the mango. Admittedly there was not much to it – essentially frozen mango juice, but still smooth and fresh. We had to be sure to eat quickly, otherwise it was going to melt all over our hands. Our best surprise of the evening: a second dessert. With the check, the waiter brought us a tray of fresh Brazilian fruits and a plastic bag. We were baffled about what to do with them until we saw the restaurant’s other patrons putting the fruits in a bag to take home. 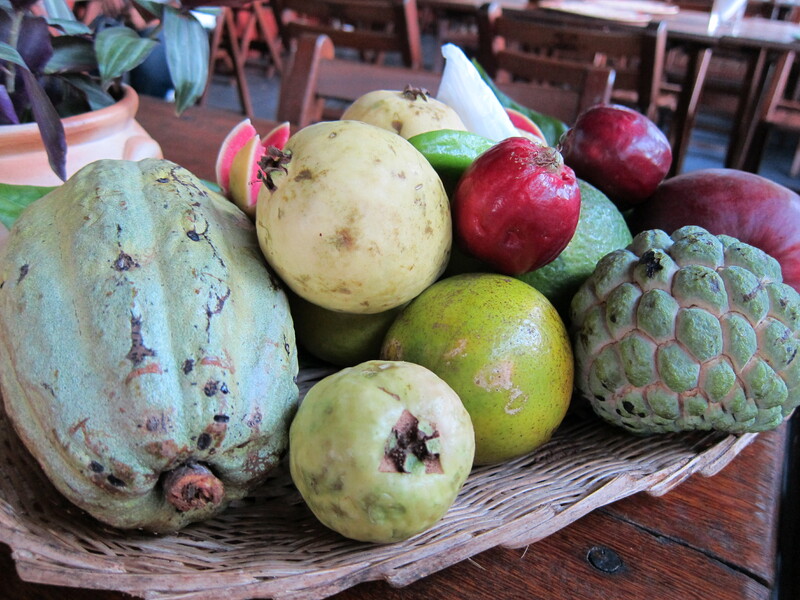 We were happy to oblige, picking up a week’s worth of fruits: guavas, pinhas, and a mango. To be honest, if you only have a few days in Salvador, this is not a place you should go. Stick to the wonderful beach and street food and the more famous parts of town, where you can meet more locals. But if you have a lot of time, and are willing to splurge, meander your way to Paraiso Tropical and experience the finest dining the city has to offer. The ambience is definitely Bahian upscale – read: American casual – and your taste buds will not leave disappointed. Our favorite part? We only learned upon trying to pay they didn’t accept credit cards, only cash. We had no cash, and no ATM. The solution – apparently a common problem – was to give us a sheet of paper with the chef’s bank account number, and instruct us to just deposit the money tomorrow. We could have left getting this meal for free. But for food like that we are more happy to pay, so the next day I walked into Banco do Brasil and deposited R$160 (about $90) into the account. Well worth it. 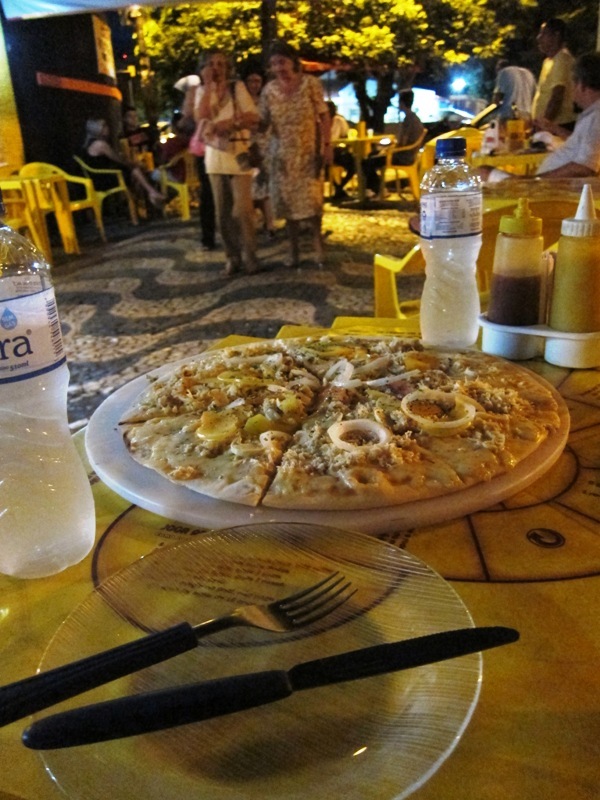 One of my first days in Salvador, I knew I wanted a moqueca. The word flows off your tongue smoother than the dende-oil infused coconut milk that is the backbone of this traditional Bahian seafood stew, and garnished with farofa (toasted manioc flour, usually with a little dende) and vatapá, there really is nothing like it. I was walking through Pelourinho, operating on the recommendation from a friend to try Panela da Bahia, a place he told me to go if I needed a “moqueca made with love.” Boy, did I! Dadá has made quite a name for herself and contributed to a renewed appreciation of Bahian cuisine. Brazilians and foreigners come from far and wide to taste her food, journalists write articles about her, and gourmet magazines rave about her restaurant. 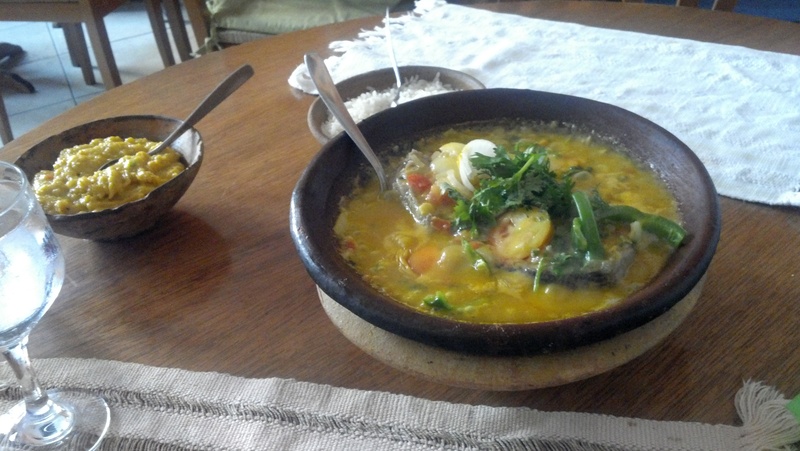 Her food certainly showcases the best of Bahian cuisine, specializing in seafood moquecas, vatapá, and bobó de camarão. However, Dadá may be coasting a little bit on her success. We found service uninspired and the prices higher than at other restaurants — typically 25% more than elsewhere. The food, however, was still as delicious as ever. The restaurant takes its name from the perpetual smile of the former queen of traditional Bahian cooking, Aldaci ‘Dadá’ dos Santos. She began her career selling acarajé on the streets of Salvador. In her heyday Tropicalista & culture minister, Gilberto Gil was a fan of her moquecas & Dadá was serving her spicy, Afro-Brazilian dishes to distinguished visitors to Bahia, including Hillary Clinton. But when we ate here last, Dadá had either taken her eye off the ball or was busy in one of her other restaurants in Salvador or on the Costa do Sauipe. The food was bland, lukewarm & over-priced. So, what to take from these two reviews? Potentially bland and lukewarm food with uninspired service? Turns out that is exactly what I got. And while the food was acceptable, it was a little pricey for what was received, and I would recommend to anyone they try any number of other solid moquecas in Salvador (three of which will have glowing reviews on ETW in the coming days). 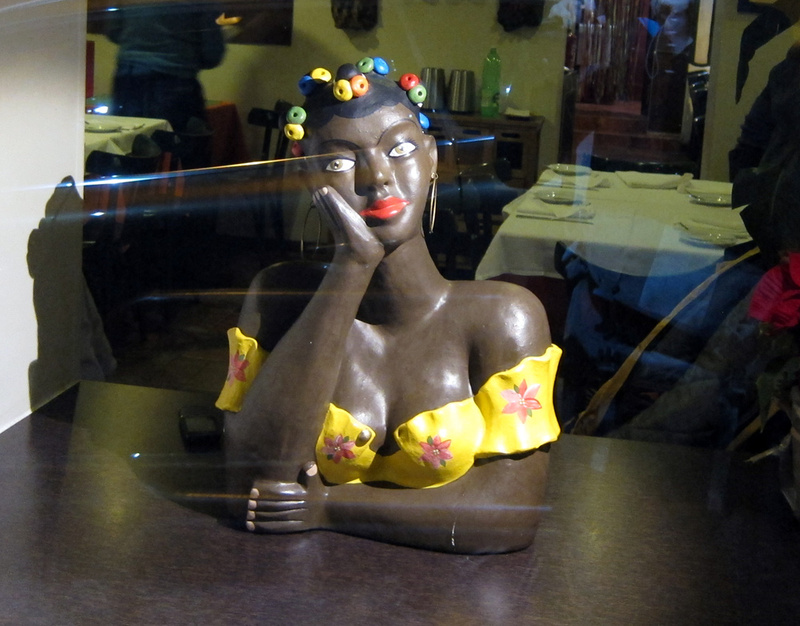 Dadá’s restaurant is not an uninviting space, but I also didn’t find it the most welcoming. The windows to the outside don’t do the best lighting job, and I found the eating space surprisingly dark for always-sunny Salvador. On this day I had the restaurant to myself; an American couple were finishing up their meal just as I arrived, but otherwise the place was empty. 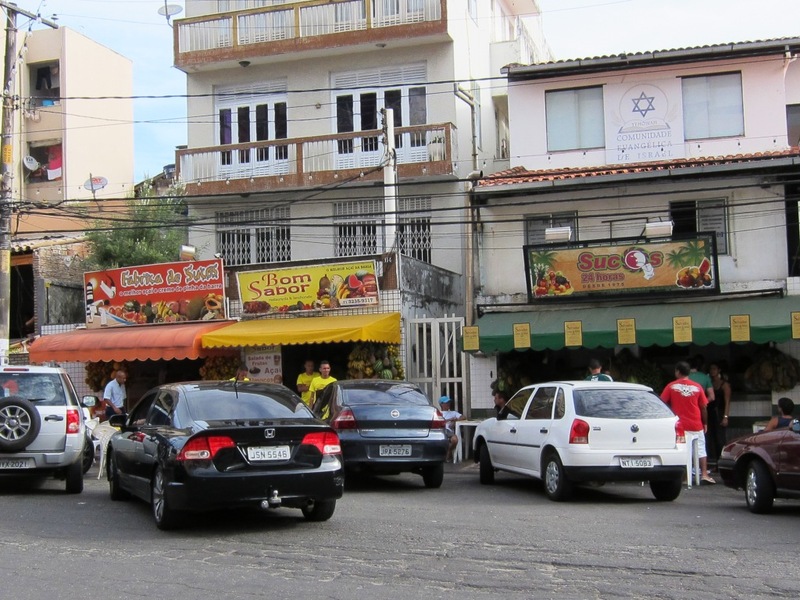 Service was a little inattentive by Bahian standards (where service is usually inattentive; it is seen as impolite to bug the customers unless they want to be bugged), though Pelourinho usually operates on a more touristic agenda for the Europeans and Americans coming through seeking an authentic meal. I decided quickly on a traditional fish moqueca, with a white fish filet cooked in coconut milk and dende, garnished with tomatoes, green peppers, and cilantro, and served with vatapá. It was not, however, served with farofa – something in the coming weeks I would come to cite as a cardinal sin. 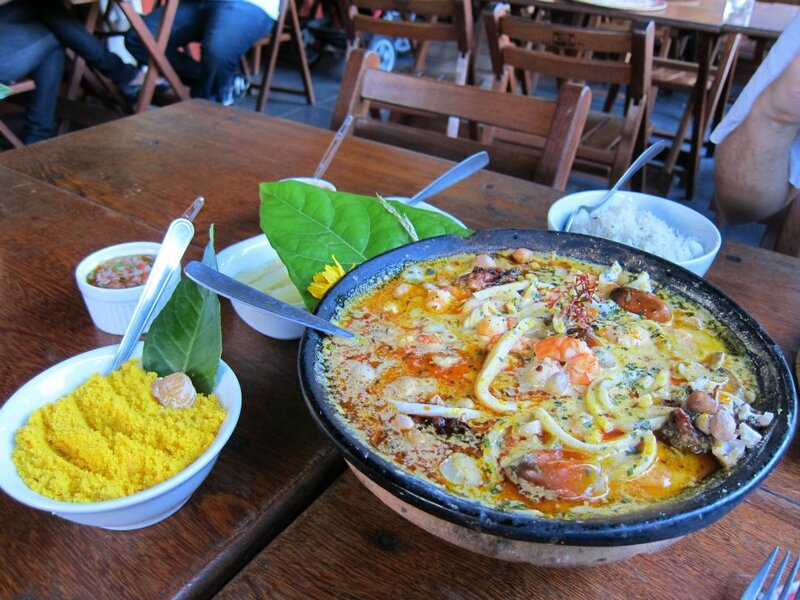 Though this was my first moqueca in Brazil, and the flavors were new and inviting, I could tell there were problems. A lack of flavor punch, a watery moqueca broth, and the fish a tad undercooked for my taste (perhaps stemming from the thin broth, which probably needed more time to cook down). “Watery” is a word one should never have to utter in reference to a moqueca, as water is not an ingredient. But it tasted watery to me, and lucky for the restaurant I am not a Bahian, otherwise someone may have made a scene. Portions were generous, more than what was needed for one person at R$39 – but less than what one usually gets in Salvador for the same price, and better quality, elsewhere. The uninspired food left me hungry for what I knew were better moquecas in the city. And our next three posts will let you know: boy, did we find them! 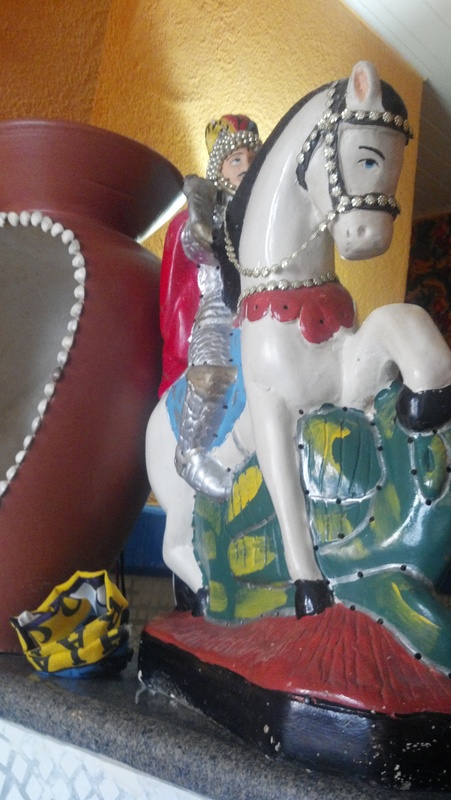 St. George (Oxóssi) stands guard over the cash register at Sorriso da Dadá. A cake shop calling itself the “Best Chocolate Cake in the World” is a pretty gutsy move. With a name like that, they would HAVE to deliver. Intrigued by the bombastic name as well as our never-ending appreciation of chocolate confections, we set out to sample the chocolate cake from MBCDM. When we arrived at the store location in Shopping Iguatemi– we were surprised to discover it was a kiosk in the mall instead of a proper store. The offerings were unsurprisingly chocolate cakes sold by the slice (about 5 dollars), along with coffee and other cake accompaniments. 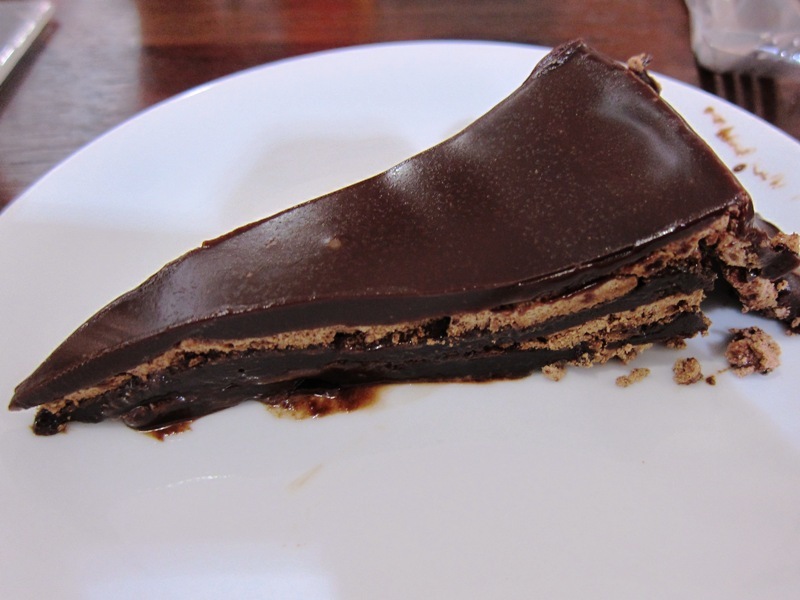 Two varieties of cake were offered by the slice: Bolo Meio Amargo (70% bittersweet chocolate) and Tradicional Doce (53% chocolate). There was also a sugar-free version of the traditional cake on offer. We went for the dark chocolate cake: the texture was that of a flourless cake. The flourless chocolate was interspersed with layers of chocolate cake crust and chocolate ganache on top. The filling was dense and uber-chocolately, but unfortunately the cake layers all but fell apart when we began to eat. As you can see below, it is already starting to lose its structural integrity – even before the first bite. Final verdict: the cake was very good, but perhaps a bit oversold. Sorry, we’re tough cake critics! 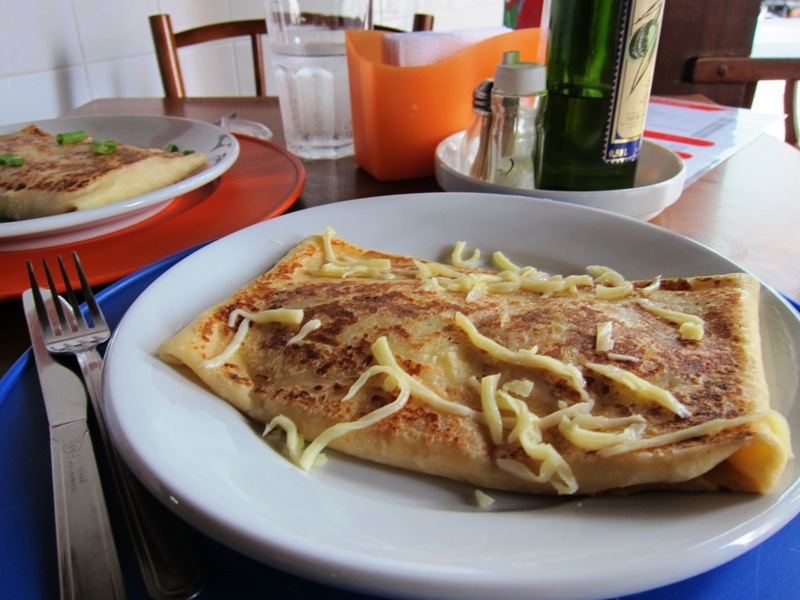 Located on the ground floor of the Laranjeiras Hostel, it is no surprise that this little creperie mainly attracts a steady stream of backpackers. The speciality is (unsurprisingly) crepes, but the menu also features a selection of sandwiches and fruit drinks. Though there are many traditional crepe combinations: sweet crepes with nutella, savory crepes with cheese and mushrooms, etc. 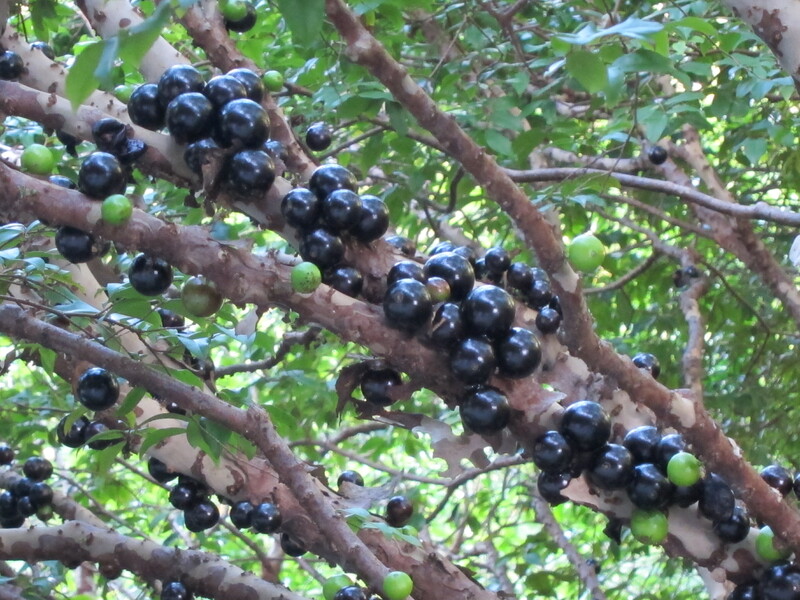 However, there are also some patently Brazilian varieties, like those filled with passionfruit, Catupiry cheese or corn. M had a Hawaiian crepe – turkey, cheese and pineapple (R$ 13), which L went for the basil, tomato, and cheese (R$ 11). We were frankly surprised at just how filling and overstuffed the crepes were for such a low price – but that was fine with us since we were extremely hungry. Like many restaurants in the area the creperie is open to the square, where you can get some people watching and a pleasant (if faint) breeze. There is very little air conditioning in this town. 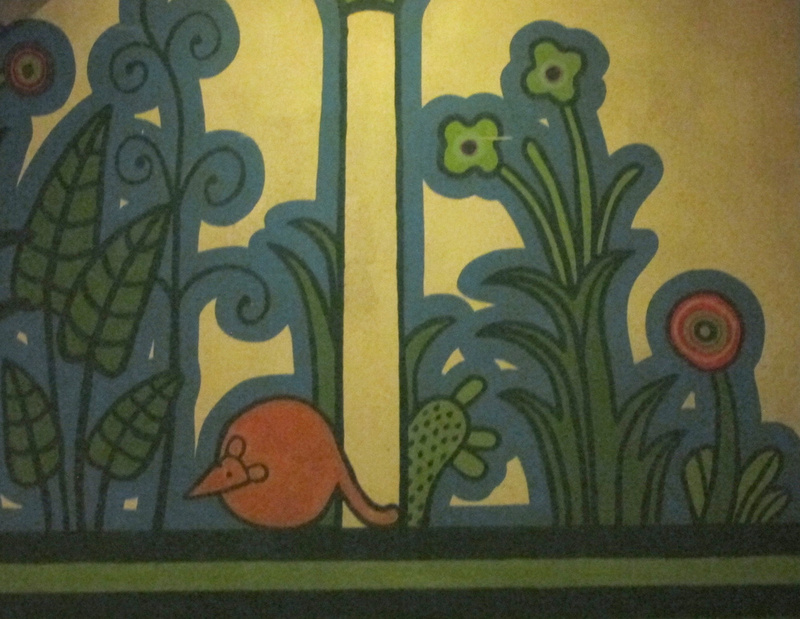 Another interesting point of difference are the cool comic-book themed azulejos on the walls (POW! BAM! etc), which also completely cover the inside of the restaurant’s bathroom. It may not be Paris, but the Laranjeiras Creperie is worth a stop for any in the area looking for a reasonable and quick lunch in Pelourinho.